After the huge success of the inaugural Australian Garden Show Sydney, held in Centennial Park recently, Event Director Anthony Bastic has announced that it will return again next year. “The Australian Garden Show Sydney will be back at Centennial Park in the first week of spring in 2014. We’ve been overwhelmed by the positive feedback from both the public and those participating in the event” said Anthony. In just twelve days leading up to the event, thirteen display gardens were built within the seven acre site. Over a hundred exhibitors offered everything from water features, decking, outdoor sculptures and furniture, to flower bouquets, books, party décor, rare plants and landscaping supplies. The People’s Choice Award was presented to Brendan Moar, who had earlier been awarded Best In Show, for his Inspirational garden “Suspended”. “As a first time event, this show has really impressed the gardening world at large. The quality of the gardens, exhibitors and presenters has been outstanding” said NGHA UK Garden Designer of the Year and Chelsea Flower Show judge, Andrew Fisher Tomlin. 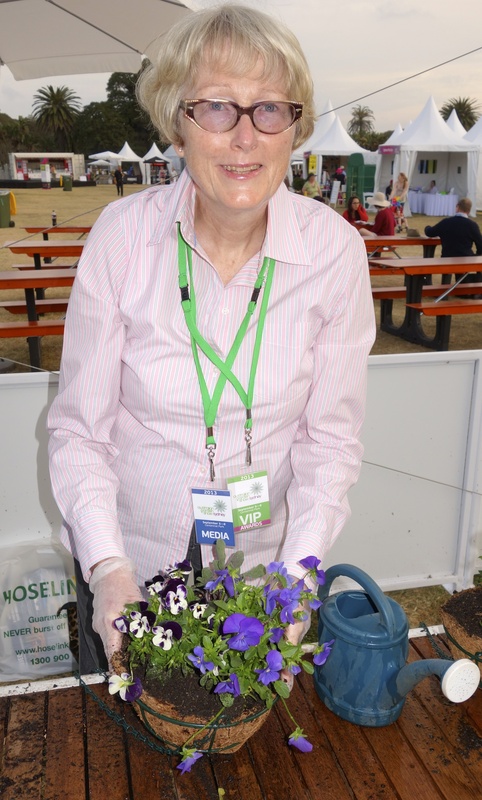 One of my favourite activities at the show was in the Lindeman’s Garden where I had so much fun getting my hands dirty while making a hanging basket. After choosing two flowering plants and a herb from the selection available, all for no charge, it was time to scoop the potting mix into the basket and arrange the plants as artistically as I could. Once completed, I was able to take it home to remind me of the show. I hope this will be included again next year. This entry was posted on Monday, September 16th, 2013 at 6:48 am and is filed under Uncategorized. You can follow any responses to this entry through the RSS 2.0 feed. You can leave a response, or trackback from your own site.